The last of Shakespeare's great political tragedies, chronicling the life of the mighty warrior Caius Marcius Coriolanus. It covers many issues including pride of coming before a fall. The ambitious mother of of the hero plays a large part in his initial successes. 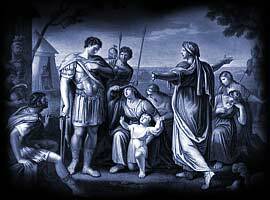 Coriolanus supports the old patrician ways and is totally out of tune with the needs of the ordinary people. Aufidius, jealous of Coriolanus's popularity with the Volscians, denounces him as a traitor, and the Volscians then kill the Roman. He then regrets his action and praises Coriolanus a real hero. there was a huge demand for new entertainment and Coriolanus would have been produced immediately following the completion of the play. It is believed that it was first printed in 1623 in the First Folio. As William Shakespeare clearly did not want his work published details of the play would have therefore been noted, and often pirated without his consent, following a performance. The number of words in the script, according to the Complete Public Domain Text is 29,375. The quotes from Coriolanus are amongst Shakespeare's most famous including 'Nature teaches beasts to know their friends'. Details of this famous quote follow, complete with information regarding the Act and the Scene, allowing a quick reference to the section of the play that these quotations can be found in. Please click here for the full text of the script of Coriolanus. "Nature teaches beasts to know their friends". (Act II, Scene I). The story was based on the life of Caius Marcius Coriolanus.